AIRTIGHT SEAL AND SECURE CLAMP KEEP FOODS FRESH: These canisters include a silicone gasket and a clamp to ensure a tight fit every time. Your foods will stay fresh and safe from ants and other bugs. IF YOU DROP THEM, THEY WILL BOUNCE: The canisters are lightweight and break resistant, so you never have to worry about them around your kids. Fill them with all your favorite essentials. COMES IN AN ASSORTMENT OF CONVENIENT SIZES: Four canisters sized 65 oz. (holds 8 cups), 51 oz. (holds 6 cups), 26 oz. (holds 3.25 cups) and 22 oz. (holds 2.75 cups). BPA-FREE AND NO DANGEROUS CHEMICALS TO WORRY ABOUT: Your family is safe when you store your perishable food in Bellemain canisters. No harmful chemicals to leach into foods. Keep All Your Favorite Dry Foods Fresh And Within Arms Reach Even dry foodscan go stale fast. And if you live in a warm, humid climate, you know what achallenge it is to keep the ants and the insects out of your pantry. Bellemainclear acrylic canisters are airtight. The flip top lids, silicone gaskets andmetal clamps ensure a tight seal that keeps bugs and air out while sealingfreshness in. You Donâ€™t Have To Play Guessing Games With Your CanistersAnymore See-through acrylic is as clear as glass but lightweight and strong -so it resists breaking even when knocked off the counter. 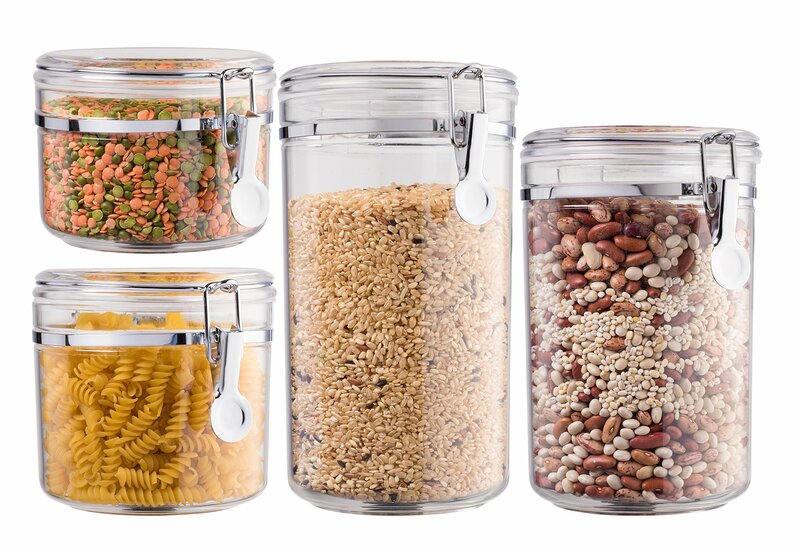 Labels are great,but only tell you part of the story - now you can know how many cookies,crackers, pasta, flour or beans are left without having to open them all upand look inside. Set of 4 Canisters In The Most Popular And Useful SizesStorage is convenient when you have airtight canisters in all the sizes youactually use: 65 oz. (8 cups), 51 oz. (6 cups), 26 oz. (3.25 cups) and 22 oz. (2.75 cups). In height, they are 9 Â¾ inches, 8 inches, 5 inches and 4 inchestall. Worry-Free Lightweight Acrylic Lets You Relax If you have children oranimals who like to explore and tend to knock things over, you can relax.Bellemain acrylic canisters are shatterproof and resist breaking even whendropped from the top shelf. They are light enough that you don't have to worryabout them slipping out of your hands and smashing into a hundred sharp pieceslike glass or ceramic. Order Your Own Set of 4 Bellemain Clear AcrylicCanisters Today and Experience For Yourself the Premium Quality.